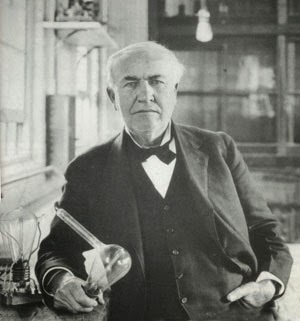 Today's the 168th birthday of Thomas Edison, one of our favorite personalities here at Hidden New Jersey. We've done a lot of reporting about hidden Edisonia around the state, from his mines in Ogdensburg, the cement factory in Stewartsville, the electric railroad and tattoo pen in Menlo Park, and the site of an old lightbulb factory in Harrison, among others. Prolific as Edison was in developing new technologies, though, one of his greatest creations was his own public persona. As reporters and the public became more fascinated with his life and career, he told his own life history with zest and verve, firmly placing himself in the continuum of American history. In fact, according to a 1909 biography published with his blessing, his great-grandfather, also named Thomas, was a New York banker and patriot who proudly signed his name to Continental currency during the American Revolution. Anyone who researches their family history runs into stories like this. The farther back you go, and the longer you wait to interview your older relatives, you discover your great-granduncle three times removed sold penny nails to Abraham Lincoln, at least according to your third cousin Mary's grandmother. Thing is, Edison's story isn't true. His family history in America does, in fact, venture back to 1730, when the toddler John Edeson arrived in Elizabeth from Holland. Thirty-five years later, he married into one of the community's most prominent families, the Ogdens and settled with his wife in current-day Caldwell. And in the lowest days of the Revolution, as the British forced Washington's retreat across New Jersey in December 1776, John reportedly provided intelligence to the Redcoats. His loyalty to the crown cost him more than a year of his own independence, as he was captured and held in Morristown by patriot forces for 13 months. Now persona non-grata in New Jersey, the Edesons moved first to British-held Staten Island and eventually to Digby, Nova Scotia with thousands of other exiled loyalists. It was there that Thomas Edison's grandfather and father were born, before the family moved to Ontario and then, eventually back to the U.S. and the inventor's birthplace in Ohio. Funny thing is, there seems to be a bit of a karmic conspiracy working on Edison's behalf when it comes to finding his Digby roots very easily. A few years ago, Ivan and I found ourselves in the small community on a birding trip and tried to find the Edison family plot reported to be in one of the local cemeteries. Despite guidance from a map done by the local historical society, we weren't able to find it. Perhaps the Edison graves were among those whose stones were obscured by the wear of age, or maybe we just looked in the wrong place, but I wondered if the Old Man was perhaps playing one of his pranks from the Great Beyond. New Brunswick's Guest House: maybe, maybe not.